Eight of Swords (R) suggests that it is time to begin your freedom – see clearly how you have created the situation you are experiencing. Spontaneously utilize your creativity/imagination and your logic/reason – combine these elements of your mind. See things clearly and turn this situation around – use your powers to transform your situation. Recognize where in your life you have power and rebuild your self-confidence. You have a tremendous potential for focusing on innovative ideas and releasing the necessary burst of energy. Stop deliberately getting yourself into “seemingly” impossible situations in order to “force” a really creative solution. Choose to use your intuition and ingenuity to liberate yourself – be receptive when the pressure is being released and KNOW that you will soon be free to forge ahead. Believe and trust that there will be relaxation from all your tension and fears as the pressures ease off and the whole situation just seems to turn around. Prepare your mind now to enjoy more freedom of thought and activity. There may be an attempt to force this new level of revelation and awareness of emotional instincts and their accompanying spiritual realities into existing lower level mental molds – this could lead to philosophical dead ends and frustration may result. The lower ego may rebel, not wanting to accept its inevitable conversion. The onset of doubts about your ability to accept more responsibility. Are you working in the right arena, on the right projects? In the first position: Some refer to this process, begun with the 7 and running through the 10 as the “dark night of the soul”, others call it “death of the ego”. It is but the metamorphosis of the small, personal, caterpillar ego changing into the grand butterfly Ego that will grow to encompass Universal Mind. In the second position: Be cautious of your lower ego. Your ideas may not be big enough by themselves for where you want and need to go next. In the third position: You are trying to see everything with your eyes – surely you know this is not possible. In the fourth position: This passion, the love of the mind itself – is the trap of mind itself. A selfish, possessive attitude toward knowledge and the gifts of the mind. It must be overturned or in time there will be little or nothing for anyone to steal. In the fifth position: One or the other inputs to the matter at hand has not been reconciled and indecision prevails. At its worst this distortion depresses the mind, making it less and less capable, more dependent on the heart and of course grace. At the extreme, rational ability is severely handicapped. A first step up out of the trap is to go with any of the options, anything but indecision. You can correct your course later, after you are out of the pit. In the sixth position: It becomes harder and harder, as you work closely with others of like goals and ideologies, to keep all your lessons in their proper places. In the seventh position: As the identity of the lower self sees its place in the universal mind and feels its thoughts merging with the one, the ego looks for ways in which it can survive and die at the same time. The process is not going well and has created an identity crisis. On one extreme, the identity aligns much too closely with the universal mind loosing its individuality. On the other extreme, the identity balks and does anything it can to avoid alignment. In the eighth position: Either things may have started a bit prematurely or there is some delay waiting for more input. 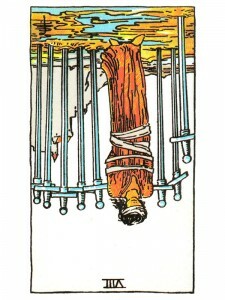 In the ninth position: The heart may be over sympathetic and therefore not do as well as it might to help the situation. On the other hand, the heart may be entirely unsympathetic and initiate a program of its own to resolve the situation. In the tenth position: Initially, you may not be enthused about the identity that emerges, missing a bit too much the old you – rest assured – this is the real you. Imagine the butterfly preferring its caterpillar body. While it is proper to miss your caterpillar stage, after all it was you, it is not proper to want to return to it. I was told by the developer that some older android devices do not have enough memory to load all 156 card images and then display the meanings afterwards. We have verified that the App works just fine if the device has enough memory. I am sorry. The tarot divisions app, both basic and pro, don’t have a card gallery that works! Every time I click on it, it says sometime like error, tarot divinations needs to close. It’s there any way to fix it? Otherwise it’s a great app.